Scientists Spot First Alien Space Rock In Our Solar System : The Two-Way Astronomers are eager to learn more about the visitor as it zooms through, like how far-off planets form: "You'd love to see if it looks like stuff in our solar system." 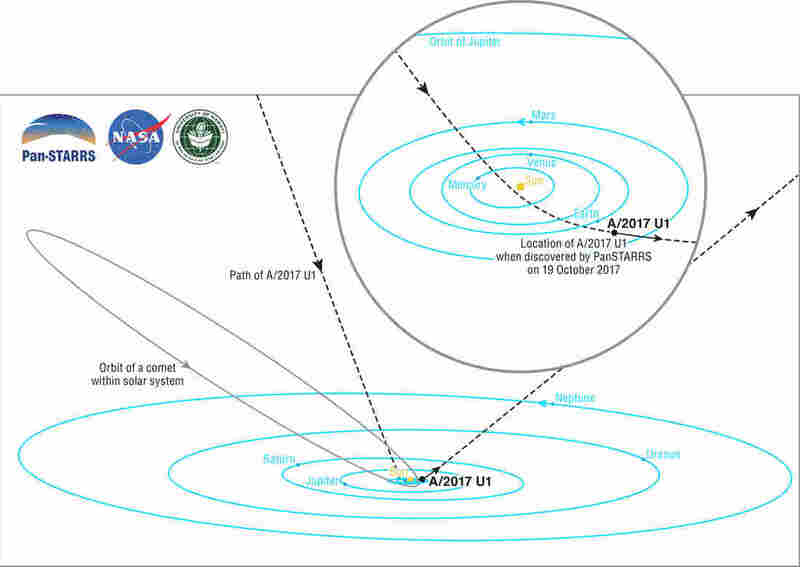 Diagram of the path of a space rock from outside our solar system — the first ever observed. Astronomers have spotted some kind of outer space rock that's the first visitor from outside of our solar system that they've ever observed. The discovery has set off a mad scramble to point telescopes at this fast-moving object to try to learn as much as possible before it zips out of sight. "Now we finally have a sample of something from another solar system, and I think that's really neat, " says Karen Meech, an astronomer at the University of Hawaii Institute for Astronomy, "and so you'd love to see if it looks like stuff in our solar system." It's long been assumed that an interstellar object like this one should be out there, because giant planets in forming solar systems are thought to toss out bits of space crud that haven't yet glommed into anything. But this is the first time scientists have actually found one. "The orbit is very convincing. It is going so fast that it clearly came from outside the solar system," says Paul Chodas, manager of NASA's Center for Near-Earth Object Studies at the Jet Propulsion Laboratory in Pasadena, Calif. "It's whipping around the Sun, it has already gone around the Sun, and it has actually gone past the Earth on its way out." The asteroid was discovered on October 19 by Hawaii's Pan-STARRS 1 telescope, which searches the sky for near-Earth objects. "It became clear that it didn't move like asteroids and comets normally do," says Robert Weryk of the University of Hawaii, who contacted a colleague to acquire follow-up images using another telescope owned by the European Space Agency. The combined observations made it clear that this was an interstellar visitor. The asteroid is now speeding toward the constellation Pegasus and is fading out of sight fast. "We might have, for moderately large telescopes, another handful of days, maybe a couple of weeks. So we don't have much time to study it," says Meech, who wants to know what its shape is and what its chemical composition might be. She says the Hubble Space Telescope should spy on this object as well, in the coming weeks. She notes that different stars have different chemical compositions, so she'd like to know if the solar system this came from produces material similar to the planet-making stuff in our own. "We've been expecting this for decades, really," says Chodas. "We don't know enough about how much material is floating around between the stars. And so this will give us the first data point. We hope to find more of this stuff."